Bonnie and I wanted to thank you both again for the awesome, amazingly fun time on Jesse James’ Great Train Robbery. It was so incredible – there is no other word!! Every adventure we have been a part of has been awesome, but this one seems even more special. I know this operation requires so much hard work for you both, but you make the issues appear almost flawless because you handle the “cards” dealt better than anyone I could imagine. I can’t begin to tell you how much I enjoyed the whole ride and, more importantly, the chance to spend some great, quality time with you both. Bonnie and I adore you both and feel blessed to have gotten to know you and become good friends with you. I only wish we lived a little closer so we could visit more often. You have indeed assembled a wonderful family – I believe nearly EVERYONE feels the same way (even “blood” related families don’t always get along with each member all the time). But the vast, vast, vast majority of this group of people are as wonderful as ANY group I have ever known. This is a reflection of you two wonderful people and speaks so well of you both because these people love you guys and it is so obviously reciprocated by you two. I stand in awe of you both. Marcie, thank you again for all that you do. You are a true an angel and one of the genuinely nicest, dearest people I know. Bonnie adores you and enjoys your company so very much. Ellsworth is a very lucky man to have you and you two are so great together. This is long, but I wanted to let you both know how great the adventure was, again. Thank you again my dear friends. Thank you both so much for a truly special and fun week in Silverton for the Jesse James ride. Bill and I had such a wonderful time being in Silverton and Durango, riding the historic narrow-gauge train, gathering with fellow riders (and non-riders), seeing the sights and, of course, for Bill, riding beautiful and challenging terrain and robbing the train! Every bit of your full and beautifully orchestrated Great American Adventure lived up to its promise of unforgettable moments, including the clever and beautiful awards, certificates, speeches and honors. I’m especially glad I got to come along this time and experience a Great American Adventure with great people who were so welcoming to me! Now I know why so many people are your ardent devotees and participate over and over. Thank you especially, Marcie, for the beautiful train ornament. It was such an unexpected and thoughtful gift and I just love it! It will always be on my Christmas tree each year along with the happy story that goes with it. Bill is so looking forward to again attending the Tombstone ride later this month. This is the second ride my sister One-eyed Jack Kass and I have taken on The Great America Adventures horseback rides. We had a wonderful time seeing old and meeting new friends on this family adventure. The close to forty people that go on these rides have a common bond and that is playing cowboys on horseback and acting like it is still the 1880’s. We dress the part from morning until evening and the local townspeople and tourists that see us in their respective towns love having us around to look at and take pictures with. This trip was the Jesse James Great Train Robbery and we rode down into the valley among breathtaking scenery to rob the train that travels from Durango to Silverton and back. The tourists on board the train had a good time filming all of us in our western garb and giving us fake gold coins. It was a blast acting like real train robbers just like in the day but all in fun of course. We rode all over the Silverton area taking in the unbelievable scenery that surrounded us in the mountainous areas. Steve and Marcie Shaw do an incredible balancing act providing all of our meals, putting together the various rides we do each day, seeing and touring all the sites and surrounding cities in the area. And they still left us plenty of time to see the sites on our own and shop in the local towns that we stay at. We stayed in Durango for several days, and five days in Silverton. We had various tours of mines, hotels, old historic buildings. 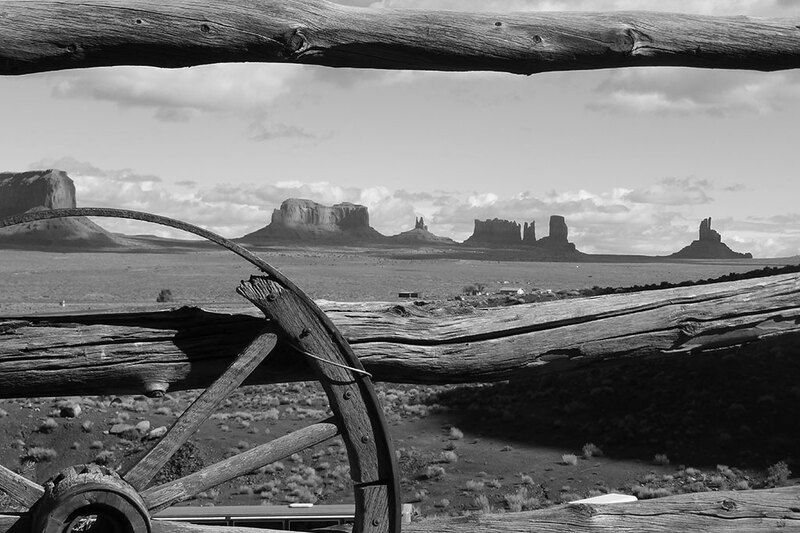 We saw the sites of many western films like True Grit, Butch Cassidy and the Sundance Kid. The tour guides told us the history and stories of the old west. Our wranglers on our rides are fabulous. They are experienced trail hands and they make the rides very comfortable and enjoyable. My sister and I have never been to this part of Colorado before and if it were not for Great American Adventures Great Train Robbery we probably never would have. The rides were fabulous, the people are amazing, and my sister and I look forward to the next Great American Adventure ride. Great American Adventures is certainly an appropriate name for a unique company. Narrated train rides, museum and hard rock mine tours prove that you can be entertained while being educated. And, who gets to rob a train without getting their picture in the post office? Twice! And, a narrow gauge steam engine! And, dressed up like the favorite cowboy heroes of our youth! Throw in riding through spectacularly beautiful country (as well as down main street) with a super bunch of folks and you have an experience that is truly greater than the sum of its parts. Although Great American Adventures’ rides travel to many different historical locations, they all include the fountain of youth. Jesse James’ Great Train Robbery ride was yet another GREAT American Adventure! Each day offered a new experience, from touring a museum to robbing the train. Steve and Marcie go above and beyond to ensure that everyone will have a good time. There was enough flexibility to allow for changes in the weather, and still keep riders and non-riders actively engaged and entertained. Our wranglers and guide were highly skilled, patient, and knowledgeable. Their horses were very well trained and their equipment was in excellent condition. Anyone who likes to ride horses, and enjoys the mountains will love this experience. The Jesse James’ Great Train Robbery was wonderful! We enjoyed good horses, fine food, and great company. The scenery was spectacular, and the weather cooperated to make the week a truly memorable one. It just doesn’t get any better than this, because you get more for your vacation dollar here, than anywhere else. I have just returned from an amazing adventure robbing a train in Colorado. Thank you so much for all the hard work you both do in order to make these adventures truly memorable. The scenery was outstanding, the robbery was great fun. The wranglers were all very professional and good company. I can’t wait to join you next year in Deadwood. Steve and Marcie Shaw out did themselves on The Great Train Robbery Adventure and Horseback Ride. It was – as always – well planned and executed… a fun time for all. The scenery was spectacular, with golden Aspens set against the rugged San Juan Mountains plus a picturesque train robbery (twice!). The vintage hotel in Silverton set the stage splendidly for this Old West desperado. I have been on three Great American Adventures over the years. I must say they were all special. You can tell the amount of planning that goes into each to make them special for all the participants. My hat is off to both Steve and Marcie for another job well done. Great American Adventures promises an adventure of a lifetime, and, boy, do they deliver! Amazing rides, scenery, and thrills — heck, we even got to rob the Durango/Silverton Train… twice! Yep, fifteen of us “adults” and one great 6 year-old divided up the cars in groups of three and four and emptied the photo-snapping and laughing customers of their gold (well, colored plastic coins) — once while riding the train and again while having ridden our horses down a series of scenic mountain switchbacks (an almost 2,000 foot elevation drop) to cut’em off at a bridge crossing a picturesque rushing river. Colorado in the Fall was spectacular, the wranglers were skilled and entertaining, and the folks from the railroad – as well as from the historic hotels in which we stayed and classic restaurants/cafes in which we ate – were inviting and truly hospitable. We highly recommend Great American Adventures (GAA), aka Steve & Marcie Shaw. Professional, courteous, fun, with every contingency handled smoothly. Want to truly experience an adventure of a lifetime? Call Great American Adventures. Steve and Marcie have done it again! GAA has come up with another great cowboy adventure in one of the most beautiful spots in America. Being able to rob a train from horseback checked off another item from my long “bucket list.” As always, Steve and Marcie planned and executed an adventure with a great location, outstanding meals, interesting side trips, in addition to lots of saddle time. This is one you shouldn’t miss! The Great Train Robbery was the best of the four rides I’ve been on with Great American Adventures. The time of the year was perfect. This was a ride I would consider doing again. The horse provided me was the best I’ve had… I didn’t have to “steer” her, she kept up a good pace and distance from the lead and I could take all the pictures I wanted while riding. I enjoyed the mine tour, the Grand Imperial Hotel treated us as very “special,” and the “photo op” session at the old train station was great. Of course, robbing the train (twice) was the highlight of the ride! What a hoot! There we were, Kincaid’s Irregulars, about to embark on the greatest train robbery in history. Eighteen or so determined folks following our fearless leader, Ellsworth T. Kincaid and his special lady, Stetson. Ellsworth had carefully selected the Denver Rio Grand’s Silverton to Durango Narrow Gage run because it carried lot of treasures: payrolls, Gold and Silver daily from the rich Silverton mining district and because the gorgeous, majestic San Juan Mountains afforded a great place to stage the robbery and make a clean getaway. We met up and started the planning in beautiful Durango. Ellsworth spared no expense in setting us up in the luxuriant Victorian Strater Hotel to conduct our planning and enjoy the sights before moving out to conduct our “business.” Ellsworth’s plans included making a trip to Silverton and stashing our gear and very quietly and unobtrusively, riding the train back to Durango to case the operation to solidify our plans. The trip up to Silverton turned out to be quite amazing as we encountered some rain then snowfall in the passes leading to Silverton – it looked like Christmas with snow covered trees, mountains and the gold Aspen background. In Durango, we had a great get together, a fine meal and prepared to make the trip back to Silverton the next morning. Ellsworth had a great idea, why not rob the train on the way back to Silverton? No one would suspect a group of finely dressed passengers of robbing their own train and, if done right, would set the stage for the big robbery. We even enlisted the help of some of the passengers and kids. Once we got into Silverton we were able to sneak away without anyone realizing we were the robbers. The snow returned and we rode out to scout the area to be more familiar with the terrain and be sure we could accomplish our goal and escape. We explored a Gold Mine and scouted out some of the other mines to see where they were located and how they got the Gold and Silver to the mills and on to the train. The scenery was spectacular and breathtaking and we knew we had picked the right place to make our foray. Ellsworth’s meticulous planning was going to pay off again. The weather broke and Thursday we set out to pull the heist. We rode about 2,000 feet down the mountains among the remaining snow and the beautiful Aspens in all of their magnificent gold, orange and reds – Ellsworth can sure pick great locations to do our robbing. We got down to the Animas River where the railroad parallels it, picked a good spot and waited on the train. The train had to make a stop and we picked the perfect spot. When she slowed and stopped, the gang quickly jumped on board and we picked them clean without firing a shot. As the train sped off, we mounted and high-tailed it back up the mountain on that beautiful trail and got away clean as a whistle. To avert suspicion, we slowly eased back into Silverton and celebrated our success. The next day we rode out to see some more of the spectacular country – God’s Country for sure – before we eased out of the area and headed our separate ways. Ellsworth and Lady Stetson had done it again – a perfect, unforgettable adventure. Now, how many people can say they have robbed a train? Steve and Marcie Shaw put together another fine adventure as they always do. The Great Train Robbery was amazing and fun. Steve and Marcie’s hard work and passion was apparent again. This is my son, Matt, and my forth ride with Steve and Great American Adventures. We have gotten to know Steve and Marcie very well and they have become good friends. But that’s one of the really great things about Great American Adventures – even if it’s your first adventure you feel as if you are on a fun adventure with good friends. Steve and Marcie make everyone feel like old friends, which really enhances the enjoyment. This is the second adventure that my wife Bonnie and my grandson Parker have participated in and Steve and Marcie have embraced us all and really, genuinely embraced Parker and made this something special he will remember for a lifetime. I know Steve and Marcie worked especially hard putting this new adventure together – we have no idea how much time, energy, preparation, logistics and, I am sure, frustration went into the Great Train Robbery. Their passion was again evident in every activity of this ride – only passionate folks could pull this off. The planning and preparation was again meticulous. We got to ride the famous Durango-Silverton Narrow Gage Train, toured a very nice new museum in Silverton, a Gold Mine, had awesome food, great accommodations, fantastic riding, the absolutely best wranglers and horses and the most beautiful, breathtaking scenery anyone could hope for. Everything they do is always first class. But no matter how well you prepare and plan, things don’t always go as planned. The weather was awesome; cold, some snow, some rain and some absolutely beautiful weather. It was raining too much on Wednesday and Steve had to reschedule the train robbery for the next day – no small task. Steve was prepared and had contingencies so we never missed some great fun activity. We had wonderful photo ops at the original Silverton Depot and railroad yard. We got great pictures robbing the Depot, around the old cars and even one of the spare Steam Engines – fantastic. Steve’s ability to plan for the unexpected and think and react on his feet is another great hallmark and he does it so well, so seamlessly that the riders don’t even notice. Steve and Marcie, thank you again for another terrific, life-memorable adventure and your warmth and friendship. Great American Adventures is truly, truly a unique and wonderful experience.